ARRIVAL IN KENYA - THE ADVENTURE BEGINS!! WE ARE HERE - TADAAAAHH! We left England on the 1st of June, spent the night in Zurich (a less than 2-hour flight) then on to Nairobi (about 7 hours) where we stayed for two nights to do some business, then on to Kisumu (a half-hour flight) - arriving on the 4th. All flights were on time and went very smoothly. Whilst in Nairobi we met with Clay Mashauri, an agriculturalist who has taken great interest in the Widows' Farm project. We want to make a large patch for growing vegetables and irrigate it using a drip-feed system from the water tower. He's the expert and he and John sat and made a lot of plans for that project. 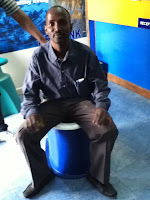 He'll be coming out to Kisumu to do it for us. We are trying our best to be good stewards of the land and resources. One of the things we want to do is definitely not at the top of our exotic or adventurous list! In different areas of the country one sees signs saying proudly "This is a Defecation-Free Village". Pollution from human waste is a serious problem in the slums. (Not so much in the villages. ) The nation is attempting to clean itself up and is setting sanitation goals. Education plays a big part in that. We want our farm to be an example of keeping the land and environment healthy, sanitary and productive. 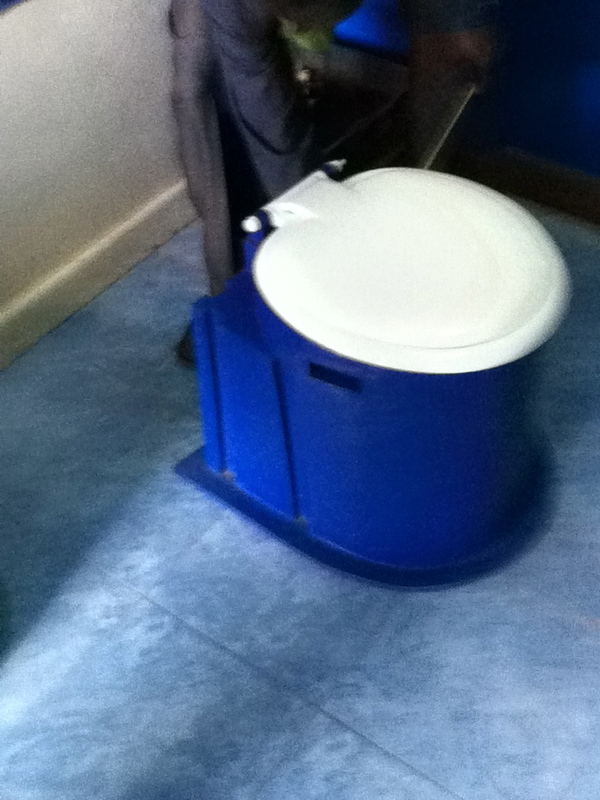 So one of our goals is to build an eco-san toilet. 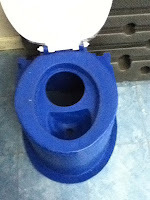 There are a few kinds - the stand-up pit-toilet model, and concrete, plastic and ceramic pedestal types. We have opted for the pedestal type. However, we are having an extremely difficult time locating a supplier. We found one toilet that we liked, but it comes from China and we can only get it if we order 100. Concrete doesn't seem practical in terms of cleaning the bowl. That leaves plastic. Still, we couldn't find any! But Clay knew a place in Nairobi where they are produced. So off we went to Nairobi city. We avoid going into that city. It is huge and crowded and not necessarily safe in some areas. We do not know our way around. But Clay does, and he drove us in his van. We found the place on the outskirts of town - so far, so good because we didn't have to go into the city. But, because Marty had seen pictures of ceramic ones, which would be ever so much easier to clean, we went looking at some ceramic manufacturers. HAH!! None of them had ever heard of such a thing!! But one place directed us to go to River Road. (Marty thought it would also be on the outskirts. But no!! ) It turned out to be right in the middle of the city and had the worst traffic jams imaginable! No exaggerating It was hot, and Clay had his window down while we were stalled in a jam; calm as could be - traffic jams and heat not bothering him a bit. He just wanted to serve us. He was using his mobile phone (brand new) and had it in his hand. A young man jumped up from the sidewalk, reached into the van and grabbed the phone right out of Clay's hand. The thief fell down, but because it all happened so fast, and Clay didn't actually realize what had happened, the guy was able to get up and run away through the crowd before Clay could think to get out of the van. Now, here is a perfect example of Kenyan temperament. Clay continued to drive along River Road so that we could look for the toilet shop. He was initially upset, naturally, but recovered so quickly and never said a mean word about the thief or said anything about just ending the search. He was as calm and cool as could be. Amazing! WE NEVER FOUND THE SHOP! Further research and investigation continues. The Assistant Chief in Kadawa has one that we are going to look at - it is made of concrete. What Is and Eco-San Toilet? 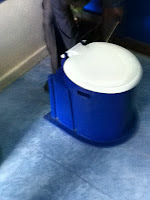 What is an eco-san toilet, you ask? The toilet housing looks like a typical outhouse but elevated. 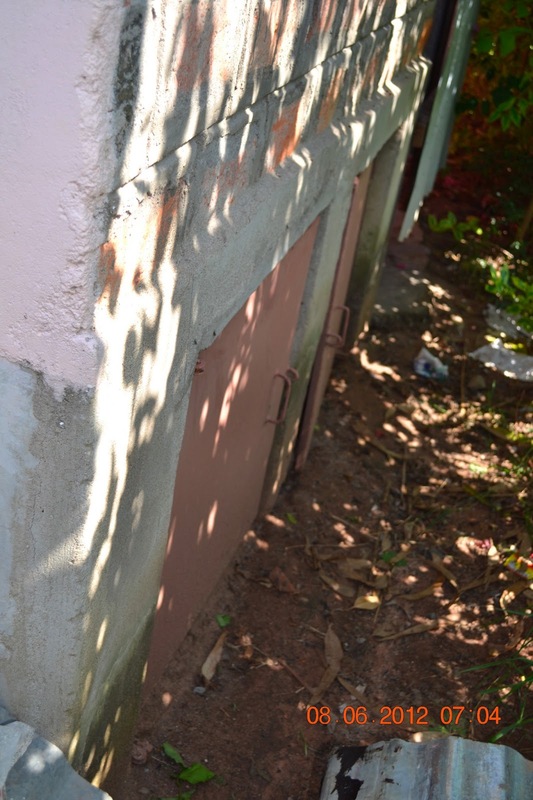 In the back at ground level is a door. The toilet itself is divided into two compartments; the one in the front funnels down to a small hole to which a hose is attached. This section is for urine and the hose diverts it into a container that is removed periodically - through the back door. It is then diluted with water and used to fertilize plants and flowers. The back part of the toilet bowl as larger and that is where the waste and paper products go - down into a large container. Ash is strewn over the waste to help decompose it and to eliminate the odor. Periodically the large container is removed and emptied into a compost bin. Believe it or not, it does compost and becomes useable for germ-free fertilizer. (We ourselves do not plan to use it! - the fertilizer, that is. It is just to hard to wrap ones head around that whole scenario.) Yes - we will use the toilet. What About the Plastic Toilet Manufacturer? Apparently these eco-san toilets are not the hottest item on the market, because, although there were a couple of them in the reception area, when they took us out into the storage yard it took a long time and several men to get to the part of the yard where the toilets were kept. After looking at the different options we went back into the reception area to look at the display sample again. At that point John wanted some pictures of the item in question and actually wanted Marty to sit on it for a photo!!!! This in front of a whole group of staff. After a squeal of outrage and a firm NO from her, the sales representative did so without the slightest qualm! There you have the first installment for this part of our journey. Thank you for your prayers on our behalf. We had a couple of days of not feeling great; John a day of "just feeling yucky". He had to go back to bed. But your prayers brought him right out of it. We'll keep you posted regularly.